- Here's how it works: This Encore 20 MOA scope base adds 200 inches of elevation at 1000 yards. A typical scope that adjusts ¼" per click at 100 yards takes about 80 clicks to add 200 inches of elevation at 1000 yards. That's too many clicks for most scopes. So, this base makes it possible for you to sight in your Encore or Pro Hunter for extreme distance shooting! - What About Shorter Distances? Good question! The 20 MOA Encore base is all about keeping your scope zero as close as possible to the center of the scope for shooting longer distances. A typical 100 yard zero on a conventional 0 MOA scope base might have 75 inches of drop at 500 yards. The 20 MOA base gives 100 inches of elevation at 500 yards... And with that base, a typical scope only has to adjust 12 clicks from center to zero at 500 yards. The base itself is enough elevation to zero a centered scope at 600-800 yards depending on cartridge and velocity. - Who Needs 20 MOA? 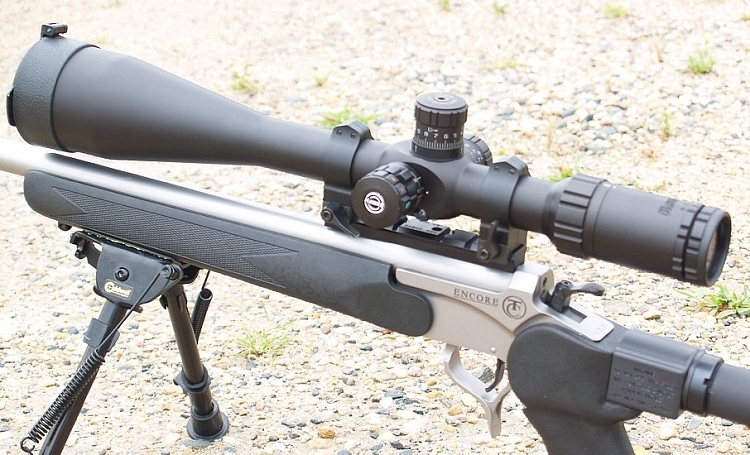 If you want to shoot at distances from 400-1000 yards, you need this Encore 20 MOA Scope Base. If you will be shooting from 25-400 yards, a standard (0 MOA) scope base would be more suitable. My partner and I hunt elk at long rang to extream long range, i shoot a thompson encore special barrel and minimum is 550 yards, this base when your 0 is 600 yards is very as it takes 20moa of the scope right away and every moa is extreamly important,we took 2 elk this year,i like one shot and that is all, thankyou for this base. base was recieved in a timely matter and was everything it was supposed to be. bought base for my t/c encore . the base is good quality and sturdy no problems with mounting it haven't got the rounds loaded yet to try the gun and mount out. but will let you know how it goes . win I mounted the scope did gain a lot of adjustment in elevation . will be returning to by again fast shipping great pricing .